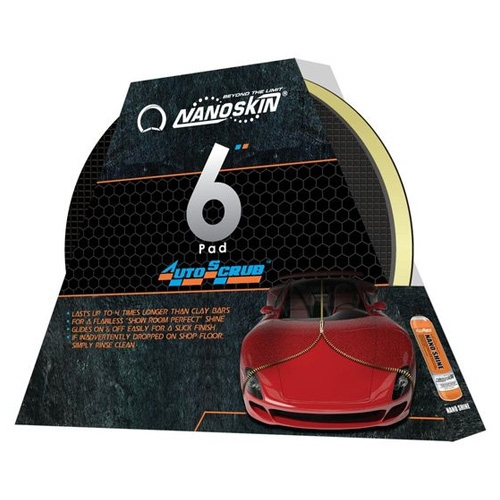 The Nanoskin Autoscrub 6 Inch Pad is a new, advanced rubber polymer technology for your dual action polisher. It works fast and safe to remove bonded surface contaminants and over-spray. 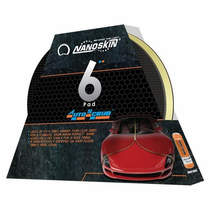 The Nanoskin Autoscrub pad works faster and lasts longer than clay. Cleaning is easy and requires only rinsing with water. Accidentally drop it on the ground, no worries, simply rinse clean the Autocrub pad and keep using it. Hook and loop backing fits any 6 inch backing plate and works with any DA Polisher. The Nanoskin Autoscrub Pad can also be used by had with the Autoscrub 5 3/4" Hand Strap Applicator. Pad can last up to 50+ cars. Available in fine or medium grades.